1. Which of these form the basis of natural selection? 2. The graph shows the distribution of fur color in a population of rodents. Over time, the environment changes so that it includes only light and dark rocks, with little vegetation. How will natural selection affect the distribution of phenotypes in this population? A. The mean will shift toward the right, and the center of the curve will be higher. B. The mean will shift toward the left, and the center of the curve will be higher. C. The mean will shift toward the right, and the center of the curve will be lower. D. The mean will remain the same, and the center of the curve will be higher. E. The mean will remain the same, and the center of the curve will be lower. 3. A recessive allele accounts for 60% of the alleles of a gene in a population. What proportion of the individuals in this population are heterozygous? 4. Question below refers to the phylogenetic tree of fly families shown. 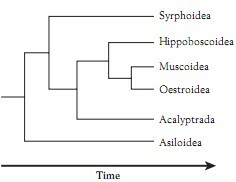 According to the phylogenetic tree, which speciation event occurred EARLIEST? 5. Question below refers to the phylogenetic tree of fly families shown. Which two families of flies share the GREATEST number of nucleotide base pair sequences?